No no no. Not those honkers. I'm talking about motorists that honk at runners while they're, well, running. Geez! At least I got your attention, right? Excellent. Yesterday I encountered not one, but two kinds of honkers. Normally I can deal with the people that give the horn a little tap-tap, you know? But I was just minding my business on the huge sidewalk and this dude just flippin' lays on the horn: HOOOOOOONNNNNNNNNNNNKKKKKK! I nearly jumped out of my shoes, it startled me so much. So, I did what any normal/civil/lady would do in this situation...I flipped him off. ;) The jerk deserved it. It's not a usual habit to do that with my middle finger, I usually blow kisses at the person because it says "you need this buddy, because I'm better than you!" The blowing kisses was my Grammy's thing because she never used the finger. She was a sassy gal. Anyway, it happened again on my second jaunt around the block, but this time with a motorcyclist. THAT was laughable. Have you ever heard a motorcycle's horn? It's completely ridiculous and puny. Might as well been a scooter, but nope, this was a sport bike. *sigh* That time around it just made me laugh and shake my head. Other than the honkers on last night's run I had a blast. My Newtons felt amazing and I ran some really tough hills in the neighborhood with *gasp* ease!! I swear the Newtons are going to be the death of my wallet; I'm hooked. I turn into some sort of superhero with those things on. No joke. My leisurely run turned into 5 miles. I'll take that! My tree in the front yard. It's confused because it's sunny/warm in February. Mt. 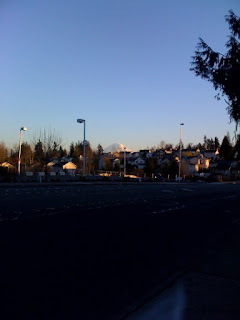 Rainier peeking over the houses--yay! Before my run I enjoyed the sun with Travis and hit some softballs. I completely crushed my last pitch at bat...first time I've hit one clear to the outfield without rolling! And the bat made that wonderful crack sound. Loved it! Tonight's workout consisted of some crazy treadmill sprinting! I was on fire in my Lunars! Fastest/longest sprint was 45 seconds at 9.1 mph (6:36 pace!?). WTH = What the honk? I thought you might be posting about geese - doh! Ugh! Honkers drive me nuts and around here it is usually people who are missing teeth or chewing tobacco. I am new to your blog. What are Newtons? I usually wave to the honkers. Maybe the one who laid it on was jealous. I love your Grammy's idea. I will have to remember that one. I hate honkers. Nothing worse than a driver scaring you mid run. Awesome time on the treadmill. How did you pick your style of Newtons? 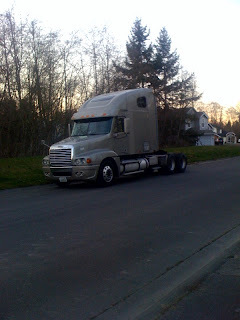 And where do you live that there are Nekkid Semis everywhere? I don't think I've ever seen one just sitting there. Sorry about the honkers. I get way more honking when I run in a skirt--must be my hotness. Right. Glad the Newtons are working for you! those honkers are the worst! i've been trying to break the "middle finger" response just because i've flipped off some people i probably shouldn't have before oops. only think worse than the honker are the holler-ers! when i was marathon training last year I accidentally routed myself through a construction zone while wearing a white Nike Dry Fit top & my aqua running skirt. Nothing quite like being honked at by a bulldozer! No, my legs are NOT all that to look at, but I do have other assets that are eye catching. So I stop in on your blog all the time, but the other day I thought I should get to know you a little bit because your post about have lead feet and "not breathing" made me think I should. I feel that way sometimes when running, it's so frustrating. I hate my inhaler. I love my inhaler. So I poked around and just wanted to say Thanks for sharing your amazing story. 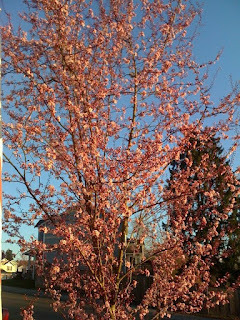 Hitting softballs, washing cars, seeing trees bloom...... AGH, I am so ready for Spring!!! I'm not a fan of the honkers. Yes, the little "toot!toot! I'm a runner too!" is cool, but not that a-holes that lean on the horn. It's rude and makes them look like losers. Honkers... LOL! I always forget about them until I run a late morning run when cars are actually out and someone lays on theres. I just don't get the point. *Honk* Ok so now what? I'm glad you are loving the Newtons girl! Don't you just love thos easy runs where you can keep going? YAY! And I am not firmly convinced that the semis are in fact stalking you. But, at least you're running, so, naturally, you're safe since you could probably out run them. Yes? Yes. I'm totally buying some newtons at the expo on friday. But only if they have the hot pink ones. I guess I'm pretty lucky since I haven't had to deal with honkers yet. The weirdest thing about this tiny town I live in is that no matter what pedestrians really do always have the right of way and motorist actually abide by that, weird! I love your grandma's kiss blowing! that is too cute! Good job on the sprinting! I think that is pretty scary on a treadmill! I Think we live in the honkingest (if that can even be used as a word)place out of all of the fifty states! I still wouldn't trade it for anywhere else, especially with our spring weather lately. Thanks for the post it made me laugh out loud. 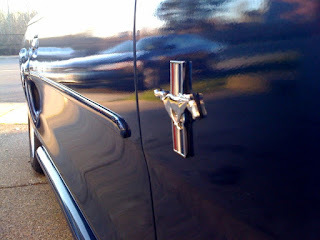 Love the Stang.. Honkers are weird.. The Blossoms on the trees make me SMILE..
Hugs to a good run!! I hate honkers! Not really hate, but just they aggravate me! The people I actually hate are the honkers/yellers. In the summer I constantly get the old men yelling "lift up your shirt" or even worse. Definitely jerks!! They must honk because they think we don't notice them and they giant vehicles barring down on us puny little runners. Blowing kisses would be nicer. I am usually trying to pull my skin back on after they startle me so I rarely wave, smile, or anything. People honking at you while running??? I don;t think anyone has ever honked at me but I would give yell at them if they did. I was on a run on Sunday and it was snowing hard. I was the only one out and there were very few cars. I had my Ipod on but not very loud and I heard a car coming up behind me on the other side of the road all of the sudden a black lab was barking and running past me. His bark sounded like he wanted to eat me (and I am very comfortable with large dogs). My heart started pounding so bad. The truck was running the dog - now why can't these lazy people just get out and walk their dogs. My brother does this and my brother is one who could really use the walk. The truck was gone before I had time to react and I was very upset. I get a lot of honks too, and I never know if it's people that I know (oftentimes I find out it is) or just stupid boys showing their appreciate for a girl running around town. Eew. I don't get honkers. But I do like your (and your Grammy's) method of blowing kisses to them! You are making me want some magical Newton shoes now! Last time I click on your link based on a post title. Oh the honkers...I get them when I am on my bike too. I feel like asking them when the last time they went running or biking...Rude people...goes back to what I said last week..."You're Not a RUnner...You wouln't understand"
Beautiful pictures. Loving this weather and I am so excited for SPRING and SUMMER! Last summer I was running in the neighborhood and a car of teenage boys came up behind me and honked and I jumped so high...they were hysterical. I was so mad! I tried to follow them to talk to their parents, but couldn't keep up. :) Your Grammy sounds like a great lady! Honking always scares me. I'm a bit jumpy by nature, so I really jump when someone hits the horn. Way to go on your treadmill intervals! Speedy! Grrr! I hate honkers! I mean sometimes it can be flattering--but there's really no point. Honk and then drive away, almost as if to say "If we were at a night club I may have come and talked to you but you're running and I'm driving so I'll just honk my horn annoyingly as some wretched sign of communication." I love the blow a kiss instead of the finger thing!! haha that is awesome! They just honked because they saw a hottt ninja runner but next time tell them just to wave! I hate the honking thing. Totally throws me off. I've heard such awesome things about the Newtons that now I think I'll look into those for my next pair o shoes. Love the car. I used to have one. Sigh...now I have a mommy car. i haaaaaaate honkers!!! i get honked at here in kentucky where i DONT KNOW ANYONE. i dont get it! I don't like honkers either. I mean, what's the point? Just keep driving and go about your business. To "MOORE ON RUNNING," my boyfriend's sister (24 years old) did that to me on several occasions. She honked at me. She drove up to me and slowly followed me. She drove up to me and followed me and rolled the windows down and said stuff like, "You want a ride?" I explained to her how that was distracting and how that also confuses my dog that is running with me. Because after her, the dog will assume all vehicles are gonna slow down. I told her when I run, I usually am thinking about a lot of things - pace, work etc. so it is best that she just slows down a little and drive by. She hasn't done that since and I love it. i get that the honk is probably supposed to be a compliment or mabye it's another runner saying hello...but really it just bugs me! 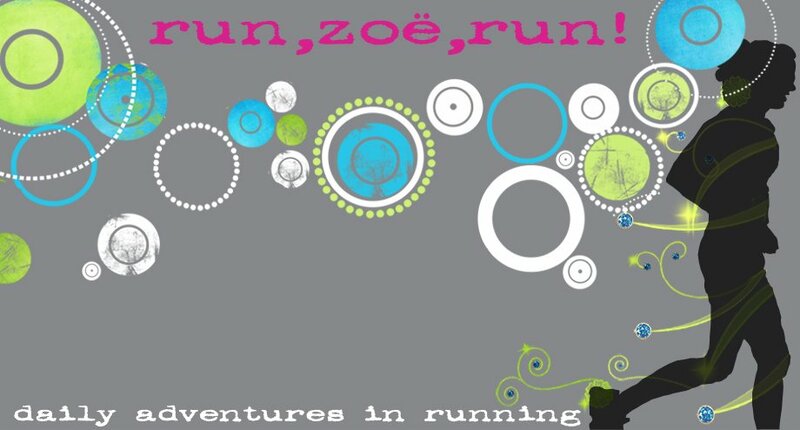 Top web site, I hadn't come across www.runzoerun.com earlier during my searches!